It’s been a while since we saw new footage of Death Stranding. 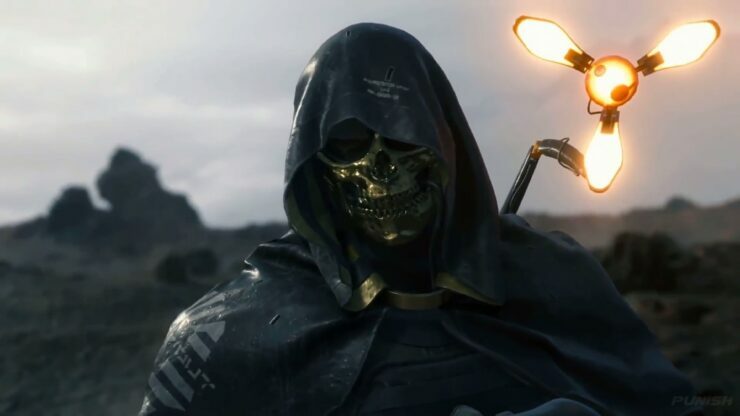 Today, fans of Hideo Kojima were treated to a brand new Tokyo Game Show 2018 trailer titled ‘The Man in the Golden Mask’. The trailer is entirely focused on introducing a new, mysterious character – the one played by Troy Baker. He seems to enjoy creating trouble for Sam, the main character played by Norman Reedus, and his currently unnamed companion. This trouble takes the form of a rather massive monster summoned by The Man in the Golden Mask himself. Sadly, the trailer ends before any combat is shown. Perhaps we could get to see that, or at least more Death Stranding footage, between the PlayStation Experience and The Game Awards events (both due in December). A couple of months ago, Hideo Kojima talked about the secrecy surrounding this project as a reaction to the ‘social network era’. In this time, people just want immediate answers, but not only answers, they also want to know what they feel. This is good, this is bad. This is a game I should like. This is a game I shouldn’t like. They want answers for what they should think. It’s like a math problem, where knowing the answer is not that important. The important thing is the process of getting to the answer. I don’t want to take away the most fun part for the players. Death Stranding doesn’t have a release date yet and is probably still a while away from its release, but we’ll keep you apprised of any noteworthy news and rumor.